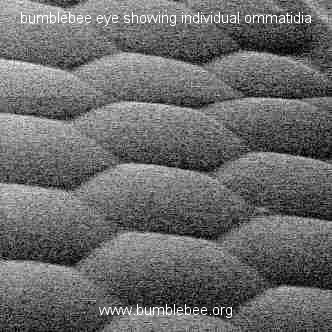 In common with most other insects the bumblebee compound eye is formed of a large number of individual hexagonal units called ommatidia (see photograph and diagram below). 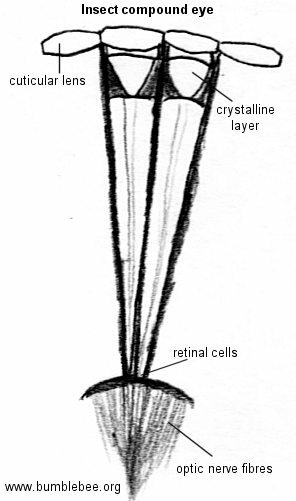 The outside part that we can see is called the lens, this lies over the crystalline cone or layer, and beneath this are the visual cells leading to a nerve axon and the brain. There are three types of visual cells, ultraviolet-sensitive, blue-sensitive and green-sensitive. The ommatidia do not have any focusing ability. 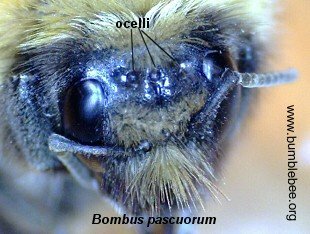 Bumblebees, again in common with many other insects, also have three ocelli (often called primitive eyes) arranged in a triangular pattern on the top of the head, see the photographs below. Ocelli look like shiny bumps, and resemble the 2 large "headlamp" type eyes easily seen in Lycosid spiders. The ocelli detect changes in light intensity. 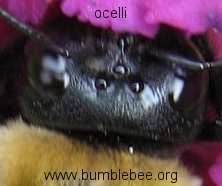 In the photograph on the right of a Bombus lapidarius male only two of the ocelli can be clearly seen as they reflect light. In the photographs below all 3 ocelli can clearly be seen. The diagram below compares the range of bumblebee vision and human vision. The centre line shows the wavelength is in nanometres, and the colours are written below the line. So humans can see wavelengths from around 400 (blue) to as far as 800 (red) nanometres, whereas bumblebees can see from as low as 300 (ultra violet) but only up as far as 700 (orange) nanometres. The three basic colours seen by humans are red, green and blue, and by bumblebees they are green, blue and ultra violet. Bumblebees cannot see red, but they do visit red flowers. This is because as well as being able to smell the nectar and any other attractive odour that the flower may emit, many flowers, not only those we see as red, have ultra violet patterns on the petals that are visible to bumblebees and some other insects, but invisible to us. These patterns guide the insects towards the nectaries, and are called nectar guides.